Spice up your lunch not only with hot sauce but with our Red Paper Lunchbags too. Instead of the boring brown that all of your peers come into lunch with come in with this red and everyone will want you to sit at their table! Whether you want to use this as a lunch bag, or are having a Christmas party that needs party favors, or maybe even a Valentine's Day gift, these will certainly come in handy. The vibrant color is great for the holidays and the paper material will make it easy for you to label or decorate it however you want! So show some passion and heart with our loving red lunch bags today! 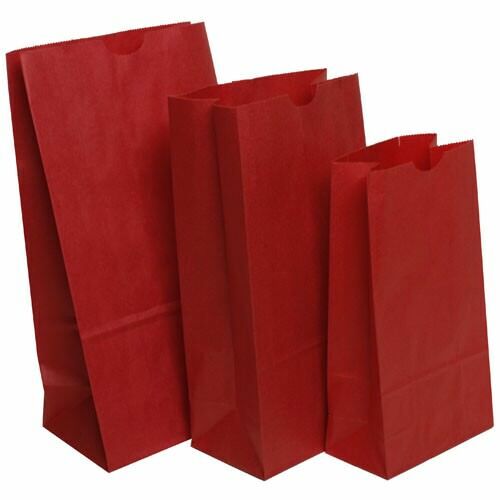 Red Paper Lunchbags are available in two colors: Red Kraft and Ravishing Red. Ravishing Red is available in medium (5.3125 x 10 x 3.25).